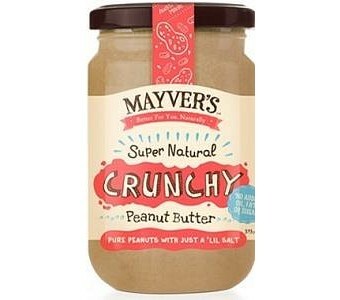 Mayver's Super Natural Crunchy Peanut Butter is made from 100% natural Australian peanuts and sea salt, crushed and blended and sold to leagues of satisfied customers. Every peanut is hand-picked, lightly roasted and stone-ground, to ensure a natural, smooth texture to the taste - no artificial oil, sugar or fat. Mayver's Super Natural Crunchy Peanut Butter is very low in salt and saturated fat and high in essential vitamins and minerals, including niacin and antioxidants.